Your home has the greatest opportunity to sell when it is first listed. It is very important to price your home at competitive market value at the time of listing. Your property attracts the most activity from the real estate community and potential buyers within the first 2 weeks on market. 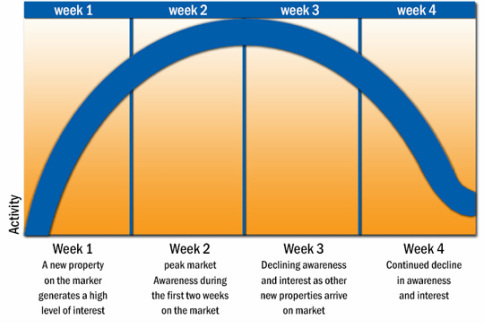 There are existing willing and able buyers in the market waiting for the right home to pop to purchase. These buyers and/or their agents have set up automatic notifications to be alerted the minute a home meeting their criteria hits the market. These buyers and their agents are already familiar with the market pricing. If they see yours is priced well over the competition you will be perceived as unrealistic and difficult to deal with and thereby they hit 'delete' and move on to the next property. Remember 87% buyers identify their home online before contacting an Agent and viewing in person. This gives you the opportunity to Sell your home for 2% Total, 1% for the Listing Fee and 1% to an agent that brings us the Buyer. If you feel that you want to offer more to a Buyers Agent, we can offer out what ever you like.